SAP Customer Data Cloud from Gigya is designed to help your company build better relationships with your customers through transparency and trust. The customer data management solution of SAP can help transform your business into a true customer-first enterprise, enhancing and personalizing your customers’ journeys while respecting their preferences and privacy. While SAP Customer Identity manages the customers and the SAP Customer Consent manages the consent, the SAP Customer Profile connects this data into various channels, including SAP Marketing Cloud. A real powerful tool for managing profiles, consent and privacy, but how can SAP Customer Data Cloud’s first-party, permission-based user information be integrated into the SAP Marketing Cloud platform, and turn it into actionable data for segmentation, targeted real-time marketing leading to a 360 degree view of people interacting with your brand(s)? For example, in your (commerce) website you get a lot of anonymous visitors who look at your products, maybe download information or put products in their shopping basket, but never iden tify themselves. With SAP Customer data cloud you have the possibility to identify those customers more easily, try to get to know them to turn them into loyal customers and even true ambassadors of your brand(s). 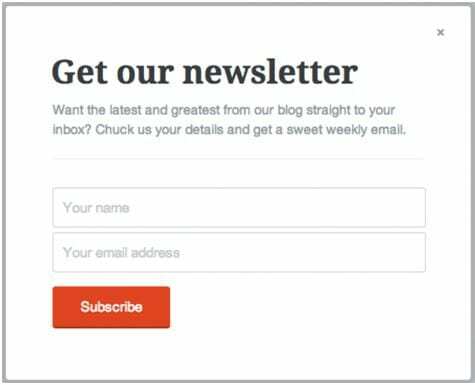 One option to do this is for example is via a scroll pop-up on your website to engage visitors to subscribe to your newsletter when reading a specific news article or browsing a specific product category on your website. This way you identify your -at first anonymous- visitors and save their profiles in Customer Data Cloud. This is also called Progressive Profiling. The profile in Customer Data Cloud is saved as a Lite Registered account together with his communication preferences (permissions) and given consent (subscriptions). This will change to a Full Registered account when the customer eventually registers himself and creates an account on the website; for example after placing an order. 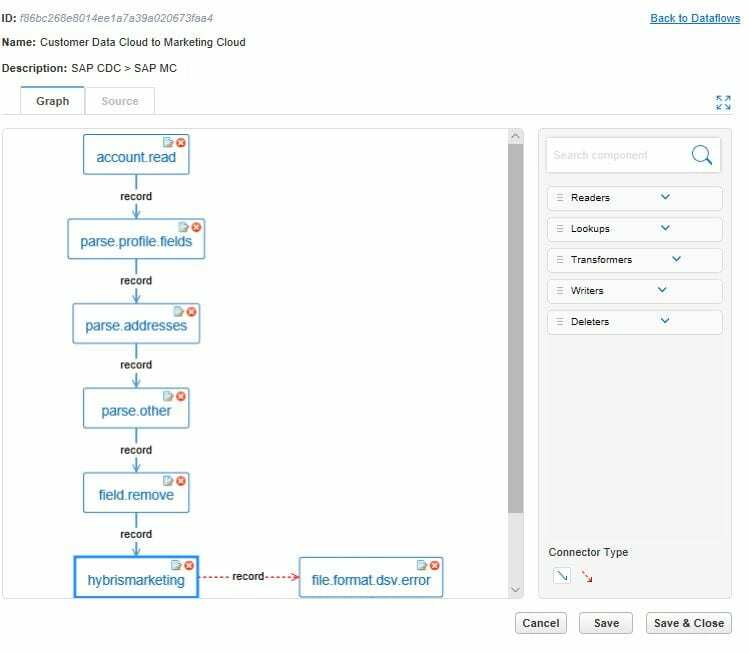 To push the profile data together with communication preferences and consent to SAP Marketing Cloud, an IdentitySync dataflow needs to be created in Customer Data Cloud that will extract data from CDC, rename fields and re-formats values to match the SAP Marketing Cloud format. This data flow will call an OData API (in this case the API_MKT_CONTACT_SRV) of SAP Marketing Cloud to push the profile, communication preferences and consent data to Marketing via ETL. Within the step parameter this API is defined, together with the settings for Communication Category (Subscription) and Communication Medium (Permission). Sending the data can be done manually, but normally this is done via a scheduled job, which runs every <nr> of minutes. 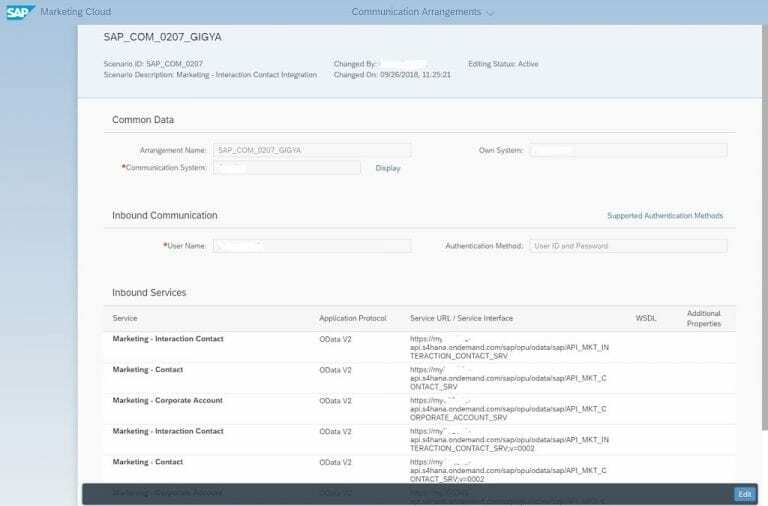 On the SAP Marketing Cloud side you create a communication system, communication user and a communication arrangement for this. 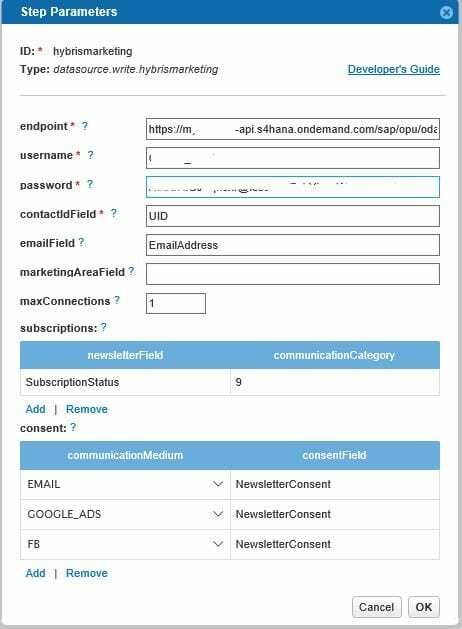 After the profile and consent data is pushed from SAP Customer Data Cloud it is available as a Contact in SAP Marketing Cloud together with the Interaction that was saved for subscribing to a newsletter. Profiles app shows the latest interactions of contacts, in this case ‘Newsletter Subscription’. 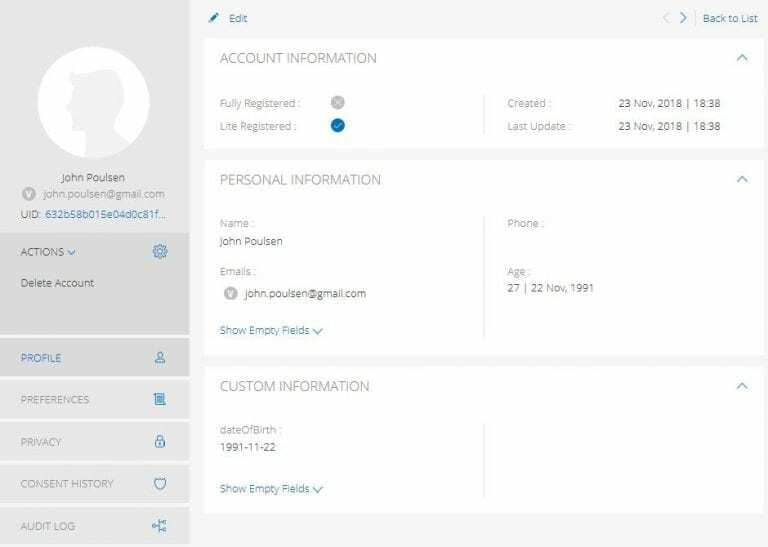 Contacts app shows the profile information like Name, E-mail, Lite or Full Registration account, Interaction data, Origin data (Gigya) and Permission Marketing data. 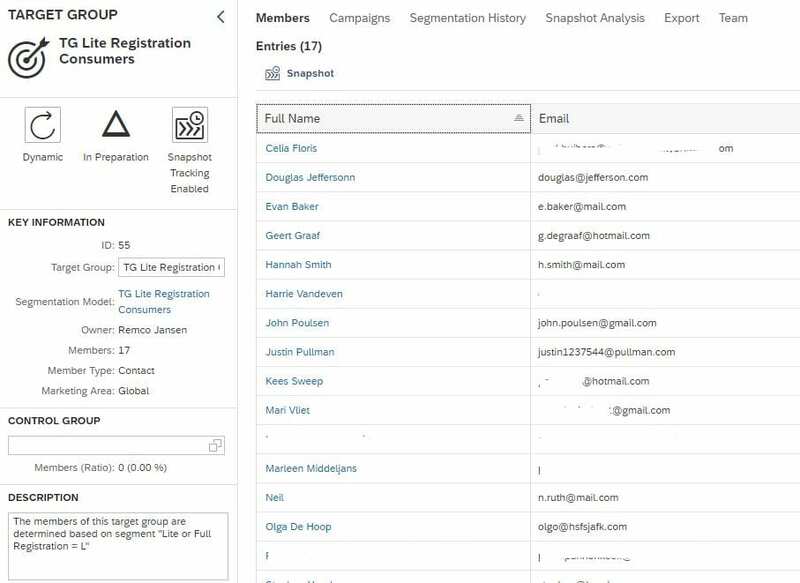 Now the profile information is available in SAP Marketing Cloud you can start using it for segmentation and targeted real-time marketing. Let’s say you want to target only your Lite Registration customers via an email campaign to arise their interest for new products. Second, create a Target Group of all contacts that are Lite Registration contacts and release the target group to use it in a campaign. Now create the Email campaign with this Target Group and choose the triggers that you want to use to follow-up these contacts. This can be a phone call or a lead as a follow-up in Sales Cloud. Curious how Acorel can help to turn your visitors into loyal customers? Feel free to contact me at remco.jansen@acorel.nl.